The United States claimed victory in a trade dispute on Friday after a key panel ruled that China's anti-dumping duties on imports of American-made cars and sport-utility vehicles violate international trade rules. The World Trade Organization dispute panel sided with Washington, saying that China acted "inconsistently" with the anti-dumping requirements, in violation of its WTO commitments. The Geneva-based international trade body allows countries to raise import duties to offset improper subsidies and dumping. But complaints filed by Washington in 2012 accused Beijing of improperly imposing anti-dumping duties on U.S.-made autos worth $3 billion. China had defended the duties on U.S.-made vehicles as legal under international rules. The duties affect cars and SUVs with engine capacity of 2.5 liters or larger. The dispute panel said China "erred in its determination of the residual anti-dumping and countervailing duty rates for unknown exporters of the subject product" and failed to disclose, as it was required, some of the information on which its decision was based. But it rejected a U.S. claim that China hadn't properly defined its domestic auto industry. China was told to conform to the trade rules. 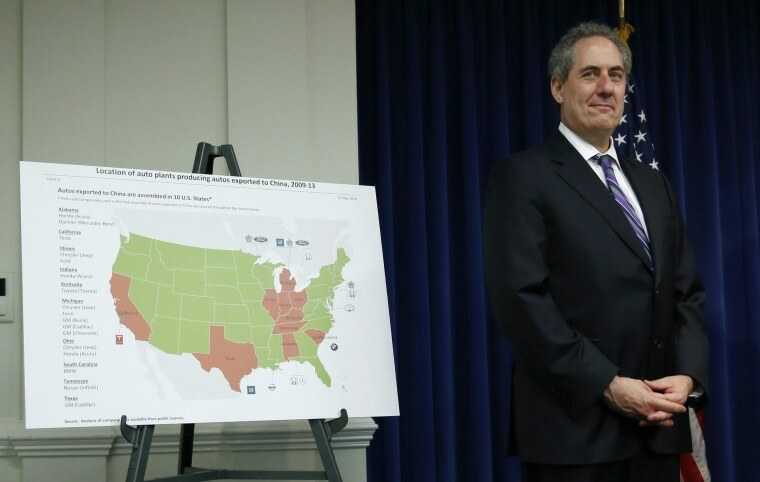 U.S. Trade Representative Michael Froman said the dispute affects U.S. auto manufacturers and nearly 850,000 automotive industry workers. In 2013, the U.S. exported $64.9 billion of autos, of which $8.5 billion, or 13 percent, went to China. He said China's unjustified duties, which ranged up to 21.5 percent, affected an estimated $5.1 billion worth of U.S. auto exports in 2013.